In the rapidly expanding battle over income inequality in the United States, the rubber meets the road in the most mundane places: airport break rooms, on the floor of big box stores, late at night as custodians clean, university offices and at fast food cash registers. Worker organizers who do so keep up the fight under the constant risk of discipline or termination, often for minor technicalities. In Minnesota, there are technically state statutes that protect workers against issues like workers compensation, wage discrimination and occupational health and safety. But using such statutes for defense can be a long and arduous road when taking on powerful employers. 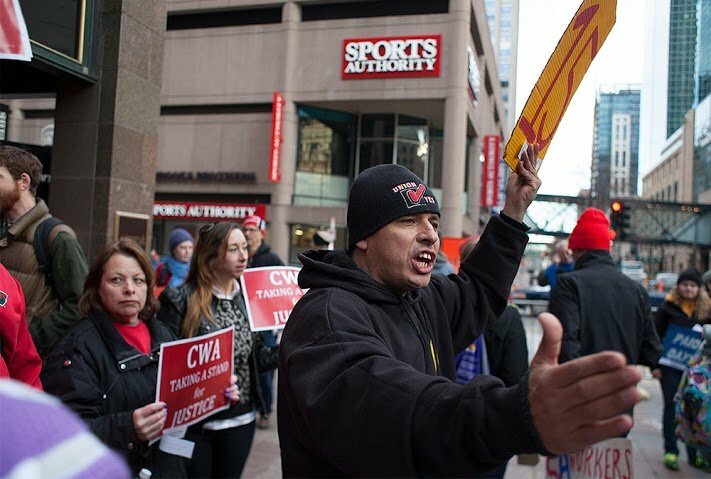 Working under a legal system that favors employers and often walking a razor thin path, worker organizers from all different industries are transforming the debate about workers’ rights, living wages and fairness. Despite having a four-year degree, Cantare Davunt found herself working at Walmart in 2012 for $7.45 per hour. When an organizer with United For Respect, a Walmart workers organizing group, contacted her, she immediately signed on. Even as a single adult, Walmart wages made her life a struggle. When she looked at her benefits, her lack of voice in the workplace and capricious management policies, getting involved was a no-brainer. At Walmart’s Apple Valley store, she found workers receptive to the idea of higher wages, a union and of doing something about their circumstances. The depression that had plagued her for the last year started to fade away as more workers became engaged in the United for Respect cause. “I felt more empowered, confident and alive than I ever had before. This was something much bigger than me,” Davunt said. By Black Friday in 2014, Davunt had recruited four coworkers to go on strike for one day, with many more supportive but unwilling to take that step. Davunt’s activities had caught the attention of management. In fact, recently released documents from National Labor Relations Board hearings and published in a Bloomberg News article show that hundreds of worker organizers were spied on by Walmart with the help of defense contractor Lockheed Martin and the FBI. 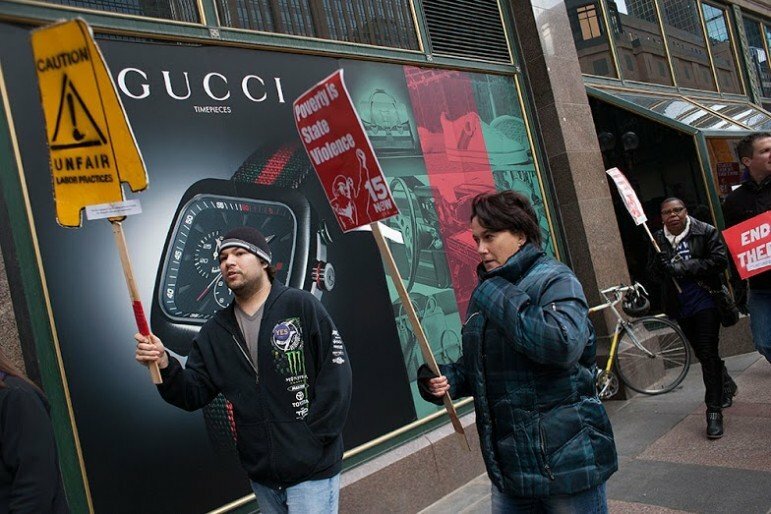 With the growing strength of the worker movement in her store, management moved to contain it. Davunt, with a spotless record and recent promotion to supervisor, found herself accused of abandoning a customer and the recipient of a final warning. When Davunt’s manager harassed and berated a pro-union autistic worker, Davunt confronted her. By January 2015, in the midst of rising tension between store management and workers, Davunt was terminated. In early 2013, an organizer for Centro de Trabajadores Unidos en Lucha (CTUL) came into the McDonald’s where Guillermo Williams was a shift supervisor. The organizer’s talk of a $15 per hour wage, a voice, an end to management mistreatment and a union immediately captured his attention. He told her, “Sign me up right now!” Like Davunt, he dove into the work that a rank and file organizer does. When a coworker suffered a serious burn at work, the store manager told her to put mustard on it. Two days later, Williams suffered a burn himself, and was told he needed to stay his entire shift. That night, he drew up a petition demanding that the store have a first aid kit on hand. Within a week, 25 of 33 workers had signed the petition. After Williams contacted the City of Minneapolis, a first aid kit was installed. Williams, in the meantime, felt he was transforming as a person. “At first I was afraid to speak in public, to lead. But fear left me,” he said. He became a leader not just at his store but as part of a national movement of low wage workers for a $15 per hour minimum wage. In successive fast food strikes he assumed a bigger and bigger role. On April 10, 2015, five days before a national fast food workers strike, McDonald’s terminated him. Like many fired workers, he brought his case to the National Labor Relations Board (NLRB), an independent federal agency designed to protect the rights of private sector employees. Because Williams was a supervisor, they refused to take his case. Even when the NLRB—which receives nearly 30,000 charges per year—agrees to hear a wrongful termination case, it can take months to years for the organization to make a decision. Regrets? Only one, says Williams. The University of Minnesota is one of the top institutions of higher learning in the United States, hardly a place you would expect to find low-wage workers among the teaching staff. Claudia Giannini teaches students how to become translators for less than $15 per hour in some classes, and does so without benefits. According to Giannini, low-wage adjunct professors make up a growing majority of the teaching staff at UMN, and many make under $15. “I am not afraid of retaliation from the administration. I am angry because I am being exploited. But some of my coworkers are afraid,” Giannini said. She has not faced repercussions for her union organizing activities with the Service Employees International Union, but she says the University has made clear their opposition to unionization through letters it had issued Giannini and others have no intention of stopping. Workers at Capitol Cleaning Services were noticing every week their checks were short because their employer was stealing their wages. Janitors like Duniyo Hussein, with the help of CTUL, decided to file a class action law suit against Capitol. They had also discussed gaining a permanent voice on the job by forming a union. Some Capitol janitors decided to strike at Macy’s and other retail stores on Nov. 10 to show how serious they were about having a voice at work. A month later Capitol terminated her for an alleged incident with a Macy’s customer. She is now taking her case to the NLRB. Full disclosure: I am also a worker who was fired for union activity and the fight for a $15 per hour minimum wage. After 26 years as a baggage handler, I was fired because during the winter of 2014, I spoke publicly about Delta Air Lines extensive use of low-wage workers as aircraft cleaners, ticket agents and ramp workers. Delta considered this an embarrassment and a nick to their brand. Many of these jobs had been high-wage, career jobs only a few years earlier. Airlines, manufacturing firms, trucking companies and others have discovered that labor costs can be driven down in a “race to the bottom” through outsourcing. I saw my low-wage coworkers, many of them East African immigrants, having to work two or three jobs to make ends meet, rarely seeing their children and surviving more than living. Thousands of airport workers signed petitions calling on the Metropolitan Airport Commission to raise the minimum wage to $15. We demonstrated, rallied and picketed. In the end, we gained eight paid sick days for around 3,000 workers and a minimum wage $1 per hour above the state of Minnesota minimum. In the days following my termination, a massive outpouring of support from my Delta coworkers, the Twin Cities labor movement, my friends and neighbors helped me weather the storm. Like many other worker activists the fight for workers’ rights is part of my life that I won’t back away from. 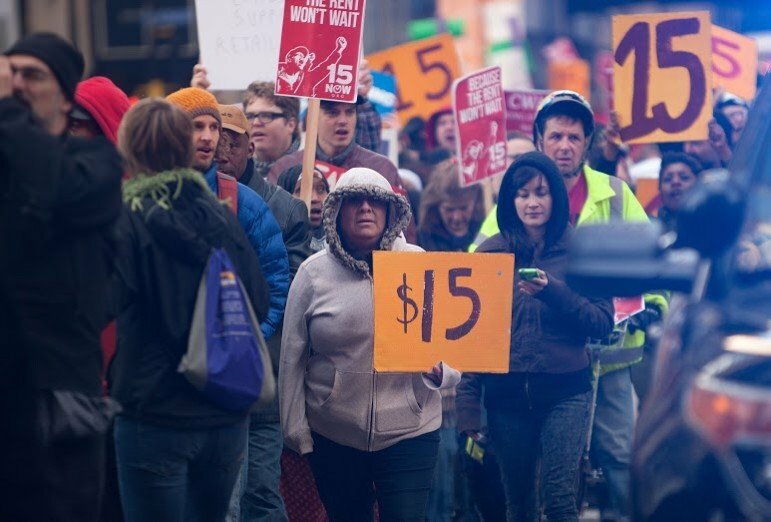 Now, the fight for a $15 per hour wage for every worker in Minneapolis is the next step for me. There is no doubt that labor laws need to become more worker friendly, that workers need political leaders that will actually take on the billionaire class. But right now, today, hundreds of thousands of men and women whose names nobody knows are changing the political ground on which we stand by pushing forward for justice every day where they work. “If they’re clocked in before they’re scheduled to work, then you don’t have to pay them.” This is a tip Eddie Wu, owner and chef at Cook St. Paul, received from another local chef de cuisine from a well-known Minneapolis restaurant.